Macro Musings Blog: What Do John Cochrane, Paul Krugman, and Scott Sumner Have in Common? What Do John Cochrane, Paul Krugman, and Scott Sumner Have in Common? What do John Cochrane, Paul Krugman, and Scott Sumner have in common? A lot more than you think. It would be easy to conclude otherwise based on the macroeconomic debates these three individuals have engaged in since the onset of the Great Recession. Each has certainly pushed a distinct policy objective, but underlying their macroeconomic prescriptions is an edifice of understanding that is complementary and points to a fundamental agreement among them on the key determinants of aggregate demand. This commonality among them became clear to me over the past few months as I was reading and thinking about what it takes to generate robust aggregate demand growth in a depressed economy. John Cochrane's 2011 European Economic Review article in particular helped me make the connections and was the inspiration for the above figure I sketched over the Thanksgiving holiday. This figure highlights the differences among them, but also points to their commonality via the two equations in the genie bottle. 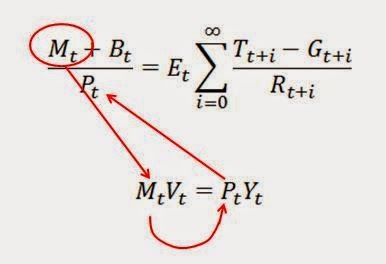 These equations come from the Cochrane paper and go a long way in helping one make sense of how monetary and fiscal policy interact and affect aggregate demand. Consequently, they help clarify some of the questions on Neo-Fisherism that have recently generated. The first term is a stripped-down intertemporal government budget equation. The left-hand side shows the current monetary base (Mt) and current government bonds (Bt) divided by the price level (Pt). The right-hand side shows the discounted present value of all expected future government surpluses [i.e. it shows the present value of expected future tax revenues (Tt+i) minus expected future government expenditures (Gt+i)]. 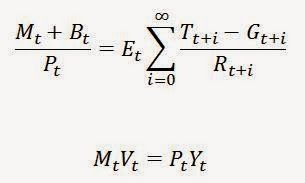 This equation tells us that in order for the current stock of government debt to maintain its value the public must expect future budget surpluses be large enough to pay it off. The second term is the equation of exchange. It simply shows that the monetary base (Mt) times how often it is used [or its velocity (Vt)] equals total dollar spending on output (PtYt). 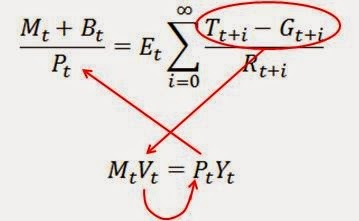 With these two equations one can demonstrate both the fiscal theory of the price level (FTPL) and the more common monetary theory of the price level (MTPL). Now John Cochrane uses this framework to motivate the FTPL view, but Scott Sumner could also use to think about the MTPL. Paul Krugman, who often invokes both views, could use it too. One of the big takeaways is that the FTPL and MTPL should be seen as complementary views of price level. This can be seen by taking a closer look at each theory. In other words, if expected future budget surpluses suddenly decline, people will start unloading government bonds in anticipation of them loosing value. This will cause the velocity of money to increase as portfolios are rebalanced away from public debt and, in turn, cause the price level to raise. Note that the stock of money does not change (though its velocity does). Hence, its FTPL name. In terms of the equations, The figure below shows the causality through the two equations. Episodes of hyperinflation provide strong evidence for this view. John Cochrane, however, is concerned that this process might also unfold in the United States given the large run up of public debt over the past five years. He worries that the U.S. fiscal credibility might unravel if the growing public debt is left untouched. I see no prospect that Japan will put off the tax hike forever. But even if it were true, this is credibility Japan wants to lose. After all, suppose investors conclude that Japan will never raise taxes enough to service its debt. What would they think would happen instead? Not default — Japan doesn’t have to default, because its debts are in its own currency. No, what they might fear is monetization: Japan will print lots of yen to cover deficits. And this will lead to inflation. So a loss of fiscal credibility would lead to expectations of future inflation, which is a problem for Abe’s efforts to, um, get people to expect inflation rather than deflation, because … what? The last time these issues came up was Japanese monetary and fiscal policy in the 1990s... Quantitative easing and huge fiscal deficits were all tried, and did not lead to inflation or much‘‘stimulus’’. Why not? The answer must be that people were simply not convinced that the government would fail to pay off its debts. Critics of the Japanese government essentially point out their statements sounded pretty lukewarm about commitment to the inflationary project, perhaps wisely. In the end their ‘‘quantitative easing’’ was easily and quickly reversed, showing those expectations at least to have been reasonable. As I said earlier, Paul Krugman and John Cochrane have a lot more in common than you think. Along these lines, one can see why the modest tax increase this year could had such large effect on the Japanese economy. The tax hike signaled the government's commitment to future surpluses and that, rather than the tax hike itself, may have stalled aggregate demand. Even though Krugman and Cochrane may agree on the mechanism and its potential to raise aggregate demand, their policy prescriptions are different. Krugman would like to have countries like the United States and Japan ease up a bit on fiscal credibility as a way to shore up aggregate demand growth, whereas as Cochrane sees such discretionary moves as potentially destabilizing. Cochrane is concerned doing so might let the aggregate demand genie out of the bottle in an uncontrollable manner. That it is where Scott Sumner and his push for level targeting becomes important. A level target, specifically a NGDP level target, would get Krugman the aggregate demand growth he wanted without letting the aggregate demand genie out of the bottle in an uncontrollable manner. A NGDP level target, in a depressed economy, would temporarily allow rapid catch-up growth in aggregate demand until it hit its targeted growth path. And since a NGDP level target would be radical regime change for monetary policy, its adoption would require enough political consensus such that fiscal policy would play a supportive role. Scott Sumner's call for NGDP level targeting is implicitly a call for a permanent expansion of the monetary base if needed. Paul Krugman has also explicitly called for a permanent expansion of the monetary base. These calls are endorsements of the MTPL. Note that the Fed's QE programs have not been permanent expansions of the monetary base and this explain why their effect on aggregate demand has been muted. Suppose a helicopter drop is accompanied by the announcement that taxes will be raised the next day, by exactly the amount of the helicopter drop. In this case,everyone would simply sit on the money, and no inflation would follow. The real-world counterpart is entirely possible. Suppose the government implemented a drop, repeating the Bush stimulus via $500 checks to taxpayers, but with explicit Fed monetization. However,we have all heard the well-explained ‘‘exit strategies’’ from the Fed, so supposing the money will soon be exchanged for debt is not unreasonable. And suppose taxpayers still believe the government is responsible and eventually pays off its debt. Then, this conventional implementation of a helicopter drop,in the context of conventional expectations about government policy, will have no effect at all. Thus, Milton Friedman’s helicopters have nothing really to do with money.They are instead a brilliant psychological device to dramatically communicate a fiscal commitment, that this cash does not correspond to higher future fiscal surpluses, that there is no ‘‘exit strategy’’, and the cash will be left out in public hands... The larger lesson is that, to be effective, a monetary expansion must be accompanied by a credibly communicated non-Ricardian fiscal expansion as well. People must understand that the new debtor money does not just correspond to higher future surpluses. This is very hard to do—and even harder to do just a little bit. So here again Cochrane is speaking to Krugman's concerns about there being too much fiscal credibility. In this case it is preventing the Fed from doing what needs to be done to get out of a recession. I disagree with Cochrane that the MTPL is just a special case of the FTPL. 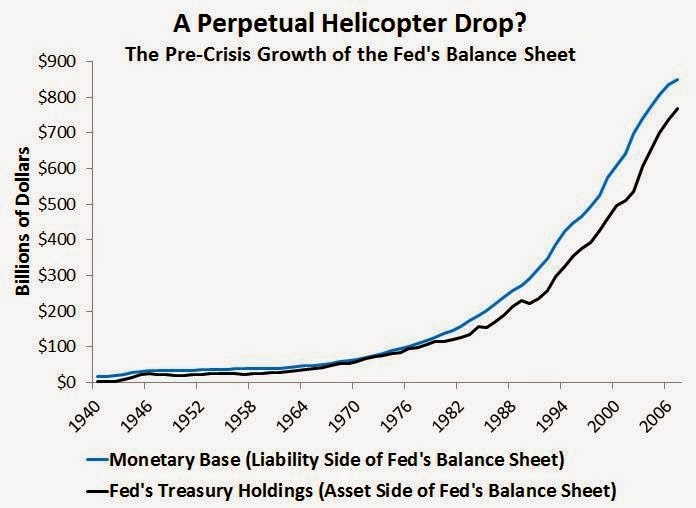 First, on a practical level the Fed has effectively been doing one long helicopter drop since its inception and never has had to worry about fiscal policy. Over time as the economy has grown the Fed has permanently increased the monetary base and done so through permanent open market operations. That is, it has permanently expanding its balance sheet as seen in the figure below. So it is not clear that should the Fed attempt to permanently increase its monetary base (say as part of a transition to a NGDP level target or a higher inflation target) that fiscal policy would offset it. Second, the Fed is not limited to purchasing just treasury securities. It can also buy foreign exchange, among other assets. So even if expected future budget surpluses were increasing the Fed could still increase the monetary base through foreign exchange purchases. This is what the Bank of Israel did during the crisis. In short, the FTPL and MTPL can be seen as separate but complementary determinants of the price level working through common mechanisms. And this is why John Cochrane, Paul Krugman, and Scott Sumner have much more in common than you might imagine. David, nice synthesis. Didn´t know you had "sketch abilities"! Thanks, but sketch abilities is probably pushing it. I was at a big family gathering over the holidays and the kids had out sketch pads. So I decided to join them and had some fun. The hard part was trying to explain the picture to my relatives. Don´t be too modest. The likeness is quite good! I think your second argument, about a permanent monetary expansion, is incomplete. If M increases due to a QE operation that buys government bonds then B decreases in such a way that M+B is unchanged, thus there is no reason for P to change unless R on the right side of the equation also changes. In fact if R doesn't change and the surplus stream doesn't change then P can't change, so it must be that V falls. The ZLB problem is that you may not be able to change R, the permanence of the Money expansion is supposed to raise future prices, thus raising expected inflation and lowering R.
Yes, if for example, the stock of government bonds is fixed then all QE does is raise M, lower B so that M+B as a whole doesn't change. In that case P doesn't change either. So I am assuming bonds continue to grow (i.e. treasury plays a supporting role) or the Fed buys up other non-government assets like foreign exchange. To set up another series of equations starting with MV = PY does not educate us very much. M, P & T can be objectively measured with some precision. Once that is done V becomes a fill number, not a true measurement of anything. Go read the Cochrane paper. The first equation is derived. The second is true by definition. The point here is that they provide a nice way to show the two theories of the price level. David, Very nice post. 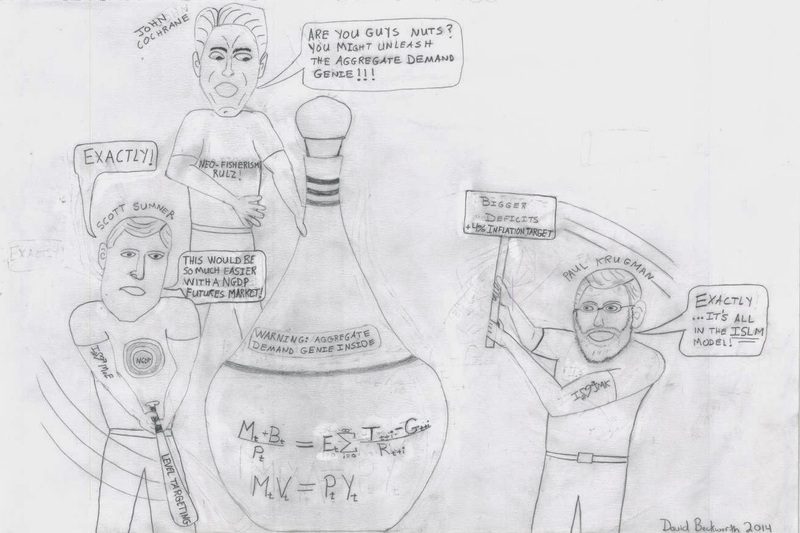 I'm honored to even be in the same picture as Krugman and Cochrane. "First, on a practical level the Fed has effectively been doing one long helicopter drop since its inception and never has had to worry about fiscal policy. Over time as the economy has grown the Fed has permanently increased the monetary base and done so through permanent open market operations." Just to play devil's advocate, but how do we know that the Fed's regular (ie non-QE) purchases were actually permanent? For instance, many of the open market operations used by the Fed to keep the overnight rate on target were really just repos, or repurchase and reverse repurchase agreements, which are by their nature undone. They are even described as being temporary in nature. Yet the Fed still kept prices on target. Or am I taking the permanent vs temporary distinction too literally? JP, yes, there are temporary Fed purchases but there are also permanent Fed purchases. Here is the Fed link that discusses the permanent purchases: http://www.newyorkfed.org/markets/pomo_landing.html The key, though, is found in the last figure above. It shows the Fed's assets (and liabilities) have consistently grown since 1940. Yes, the permanent purchases have to be rolled over as they mature (in addition to new permanent purchases) in order for the Fed to keep its balance sheet growing. But the fact that the Fed is doing this is reason to believe the Fed wants this expansion to be permanent. I don't see why fiscal policy would necessarily be supportive. You could have massive government spending and investment at Northern European level with monetary policy still targeting an NGDP path level. Simon Wren-Lewis has proposed "Fiscal Councils" which would be like a central bank/Federal Reserve and could be a little more technocratic and quicker in action than the legislature. When was the last time the genie was let out of the bottle? The 1970s? I believe Steve Randy Waldman has it right that it was mostly about absorbing the large number of boomers and women entering the workforce. It was a demographic challenge with which the Fed did the best it could. As productivity went down inflation went up and you got a temporary stagflation of sorts as the snake of the economy digested the rat of boomers entering the workforce and it moved through the body. The Cochranes just don't like tight labor markets and wage inflation and so cry wolf about letting the genie out of the bottle. This is something of a tangential question, but I can't seem to find an answer anywhere. I was wondering about what the expectations notation E_t represents. For example, in these lecture notes  it starts off with E_t[... stuff ...] which I assumed was an expected value functional (sum or integral over the expected probabilities of each state multiplied by the different values of "stuff"). Later on in  and in the equations at the top of this post, it appears that E_t is just multiplying what I thought was its argument, i.e. Is E_t an operator (this seems most likely to me, but I've never read that explicitly anywhere)? Have we notationally simplified E_t[...] to E_t..., dropping the brackets? Is "E_t stuff_t+1" taken as a whole? Is it just a real-valued variable? Does it represent some kind of economics cultural knowledge like how physicists in the US sometimes use eta_mu, nu instead of g_mu, nu to indicate use of the "east coast metric" vs the "west coast metric"? It's incredibly horrifying that FTPL is believed, by anyone, to be remotely related to individual decisions about government bond purchases. I'm trying to think of one thing less related to individual purchasing decisions about government bonds than long-run wild guesses about government surpluses. Since the government doesn't have to pay off its deficits for an individual person to recoup their bond purchase and interest, it doesn't even make first-order logical sense. So you're saying both Cochrane and Krugman are wrong? "Yes, if for example, the stock of government bonds is fixed then all QE does is raise M, lower B so that M+B as a whole doesn't change. In that case P doesn't change either." Right. And, by implication, the Fed might reduce M to zero so long as it has bonds enough to sell for the purpose, and P would in this case also remain unchanged, presumably because we would all carry on shopping with T-bills. An clever theory, no doubt. But not quite what I taught you! Touche! I am getting trounced by you, Bill Woolsey, and Nick Rowe on this. Time to regroup and do a new post on this clever theory. Are We Mismeasuring Productivity Growth?